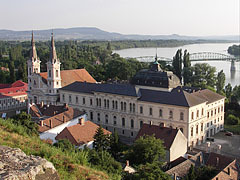 In the history of Hungary the leading role is shared between Székesfehérvár, Buda and Esztergom, which is situated in the western gate of the Danube Bend. 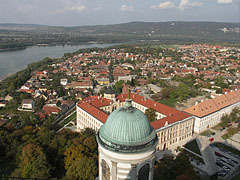 The castle, standing on a hill, used to be the residence of the Árpád dynasty and it is still the centre of the Roman Catholic Church. Back in the 10th century it was Géza, the ruling prince of Hungary, who chose the hill to be his quarters. The area was very important owing to the fact that Arabian merchants passed through here heading for Prague. 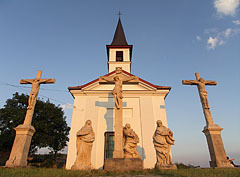 Vajk, known latterly as St Stephen, was born here. He started his offensive against Koppány from here. It was here he was crowned the first Hungarian king on New Year’s Day in 1001. The city became a real capital after the death of Géza, and his son, Stephen, grew up in the palace built from the castle ruins. The ornamental gate of the castle, its decorated pillars, the rose-window and its own chapel are still standing. Esztergom was not able to avoid the Tartar Invasion. The city was devastated by the troops coming from the east in the winter of 1242. Three hundred years later, in 1543 Sultan Suleiman seized the settlement, and during the recapture many of the medieval buildings were ruined. 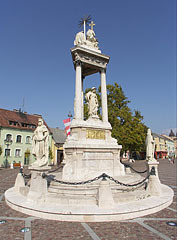 The city is strongly connected with several people of the Hungarian cultural life. The most important are: János Vitéz, the humanist chancellor of Matthias Corvinus; Bálint Balassi who was fatally injured near the walls of the castle and Mihály Babits, the well-known writer, who came to the city in his declining years. This city, with its many precious historical sights and system of cultural institutions, is a significant intellectual centre. The Cathedral of the Archbishop is located on Castle Hill. It was built in the 11th century in honour of St Adalbert, the tutor of Stephen I, together with the palace and the building of the church. The only existing part of the medieval cathedral is the Bakócz Chapel, which is built on the southern side of the present 19th century cathedral. 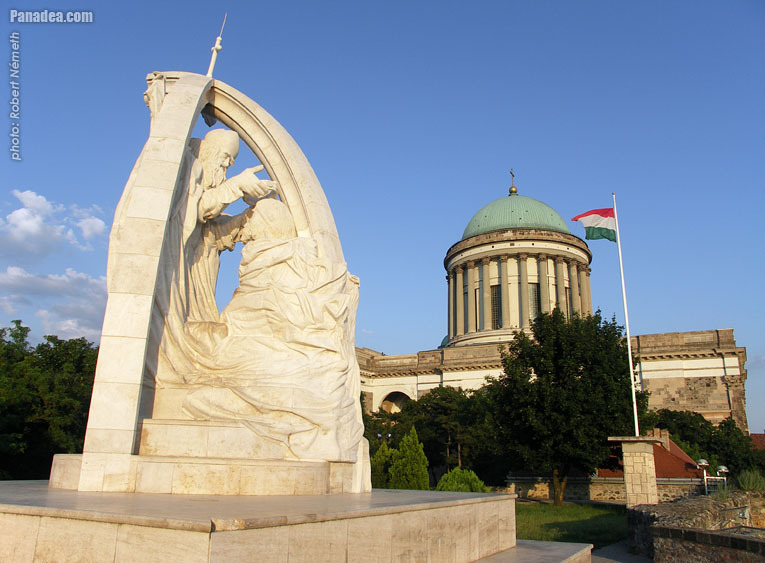 The building material is Hungarian red marble, which was meant to symbolize the dignity of the archbishop. 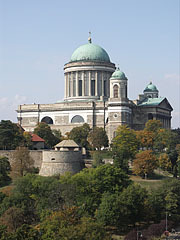 The 100-metre-high, 118-metre-long, and 49-metre-wide cathedral in neo-classical style used to be the largest church in Hungary. The altarpiece depicts the Assumption of the Blessed Virgin Mary, which is probably the largest painting in the world painted on a single piece of canvas. In the upper rooms of the cathedral, in the world-famous Treasury, the most valuable works of art are exhibited. These include the crown silver cross, the chalice of Benedek Suky and the Matthias-Calvary or the Báthory robe. The palace is one of Hungary’s oldest stone fortresses. Géza started construction work on Castle Hill and in 972 he pronounced the place his residence, because it was the most important settlement along the waterway connecting east and west. The castle was extended by Stephen I, who was born here. The charter of the Esztergom Archiepiscopacy was founded in 1001; and it was here that the first money of the Hungarian kingdom was minted. The Tartars devastated the city in the 13th century, but they were not able to invade the castle. 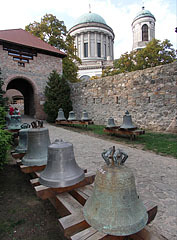 This is why Béla IV moved the population of the city into the castle. Later the people did not want to live together with priests and churchyards, so in 1256 they moved back into the original city, on the banks of the Danube. The prime year of the castle was in 1396, when János Vitéz, being a patron of culture and the tutor of Matthias Corvinus, transformed it into a Renaissance palace. After the Battle of Mohács in 1526, when the Turks achieved a decisive victory over the system of the Hungarian border castles, Esztergom had to face the Turkish army as well. In the spring of 1594 the king’s army started a hasty offensive against the castle, but the Turks were able to beat them off. Among several hundred soldiers, Bálint Balassi, a great figure in Hungarian literature, was killed. According to folklore the Pasha, the last leader of the city, feeling his approaching end, hid his treasures inside a donkey made of stone and so made the people believe that the donkey is the sacred animal of the Turks. When surrendering, the Pasha had only one request, namely that he be able to take the statue with him. Later, safely sailing down the Danube, he smashed the donkey up with a hammer to obtain the vast number of golden coins. In the castle, now operating as a museum, visitors can see the oldest sitting room in Hungary, which was owned by Beatrix, the widow of Matthias Corvinus in the years after 1490. 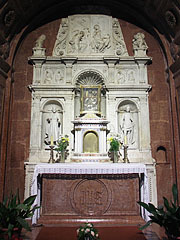 The study of János Vitéz and a quite early Gothic chapel can also be seen. With the Treaty of Trianon in 1920 Upland was taken from Hungary and the bridge destroyed. The only way for broken families to keep in touch was to go down to the banks of the Danube and communicate by shouting across the natural sound-transmitting water. It was only in 2001 that the destroyed bridge, left in ruins on purpose, was re-built. Thus a direct connection was set up between Hungary and Slovakia, which is fortunate for those Hungarians who were torn from their country.